Lucas looking ‘happy’ with his new pals. The big news this week is George Lucas’ decision to sign over his film production company LucasFilm, including its flagship brand Star Wars, for $4 billion (around £2.5 billion). I’ll be honest, I love Star Wars. I’m not a fan enough to dress up, attend premieres or know every single line of dialogue, but I’m a fan enough to know that Han shot first. The original trilogy (that is Episodes IV, V and VI) sat in my living room in a boxet on VHS and my brothers and sister used to sit down with our dad to watch them. Loved it. Even if we didn’t really get it the first time round. Then out came Episode I: The Phantom Menace. I was nine when this happened. I didn’t feel any of the indignation at what George Lucas had done to the Star Wars universe that other fans did. I was too busy marvelling at pod races, laughing at Jar Jar Binks and those silly droids that (although being impressive automatons that can wage war) were still completely accident-prone. I regret all of that. Looking back on it now, after truly visiting the original trilogy and being taken into the world I realise just how low the series has come. It was diluted and made comical for children, and I was taken in (for shame!) but let’s be honest, Darth Maul was bloody awesome. 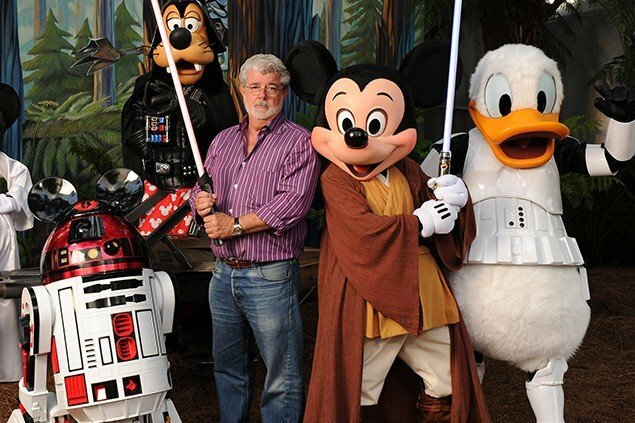 The problem is, the original trilogy had very little of George Lucas’ original ideas included. He was heavily edited and criticised by his production team and the films we loved were hugely different to what he expected. To be honest, Lucas didn’t think he was making one of the most bankable and amazing franchises ever to come out of cinema. He knew all of that by the time that 1999 came around though. He went and destroyed everything, putting his ideas to paper (when they weren’t all that great) and no one was willing to say no, because he was the ultimate authority. I’m sure all you Star Wars fans know this (or some of it) and will understand that it’s probably a good thing he stepped down. Disney have been ridiculed about their purchase and the internet is full of derision about how they’re going to pander to young children (even more so than Episodes I, II and III). But let’s just think about this a moment. Disney picked up Pixar and that has turned into one of the most wonderful film production studios in the world, routinely creating fantastic storylines and characters that capture the imaginations of the old and young. They also have the rights to most of the Marvel Comics characters and produced the recent Avengers movie. Sure, it wasn’t ‘deep’ or as brooding as say, Nolan’s Dark Knight trilogy, but I’ll be damned if it wasn’t spectacular and a joy to experience. Disney know how to deliver to fans what they want, they bring in experts like Joss Whedon to do justice to franchises and produce top quality films. I’m not worried about Star Wars: Episode VII coming out (Disney has hinted at around 2015) and I’ll definitely be queuing up to get a ticket. Let’s look at it this way, it can’t hurt the wonderful original trilogy (even though Lucas tried with his remastered editions that caused another fan backlash – see the Han shot first reference) and it can’t be much worse than the prequel trilogy. So let’s hope they get someone brilliant on board, who knows the universe and what the fans want and deliver a fantastical and well-fleshed world full of intrigue and mystery (none of that political rubbish that stifled Episode I).